that this is so seriously pink (and I hardly ever wear pink) that I think I may puke because of it. One thing I get frustrated hearing on blogs is "this polish looks so much better in real life" or " I just couldn't capture all the sparkles" etc. 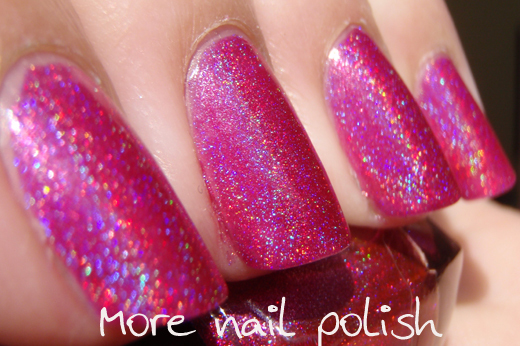 I hate reading that cause I want to see what the polish really looks like, I need to see the sparkle. I think, come-on, take more photos, try different lighting, change macro setting, fiddle with other fancy doohickeys on your camera. So can you guess what I'm about to say now. This polish looks so much better in real life, I just couldn't capture all the sparkles. I really tried. I did take more photos, at least 50. I changed lighting, indoors, sun, artificial light, flash. I macro-ed, zoomed and cropped. I even fiddled with the doohickeys. Short of photoshopping the pics to make the holo better, this is all I could do. So please imagine more holoie goodness if you please. I think it's because of the metallic finish that I couldn't photograph it correctly. But it's because of the metallic finish that I love it so much. Even indoors with no artificial lighting, although it's not holo, it's metallic. Shiney hot pink metal. Do you want more? What colour? I love this franken! 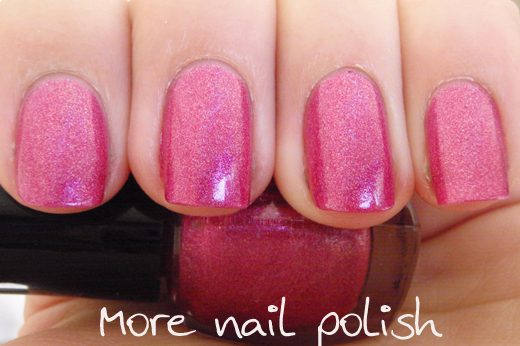 And i want it :D It would be the perfect pink for me :D. I love your franken so much! this is so gorgeous! i have the powders, however i'm now waiting for my kleancolors to arrive and this will be the first one that i will make! 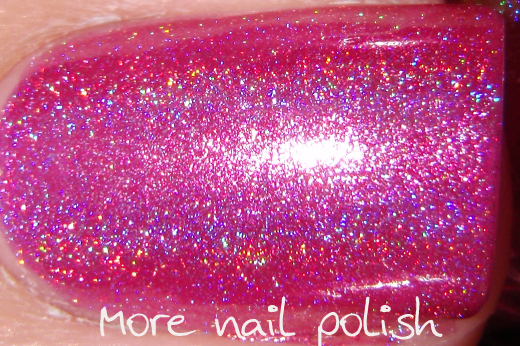 It's the pinkest pink holo I think I've ever seen! Pink puke is gorgeous!! I'd like to see you try like a teal holo..is that possible? Or how about in navy blue? or grey? this looks amazing!! Great job on frankening. I have never done this. Cool - glad you all like it. I still think it's just a bit too pink for me, although my mum just said to me "But you dress your daughter in that colour all the time". Yeah but she is 8 months old! Kejal - I have made a navy blue one, I'll post it soon. Off to create a teal holo and a grey. I've made a black before with the 20 grade spectraflair, but I really want to do a grey one now! I love pink it's my favourite colour!!! 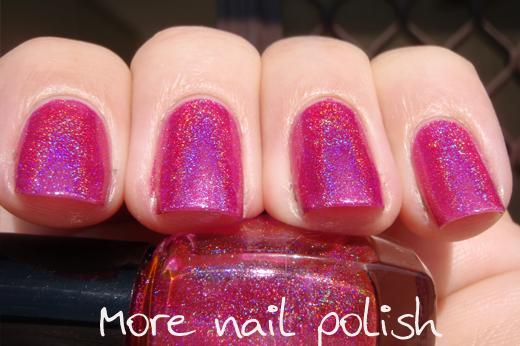 My camera is not as high end and hates holos :(. But your pictures look amazing! And I think the name is wonderful. NIce job! It's beautiful and I'm not into pink either. My vote would be grey or olive! 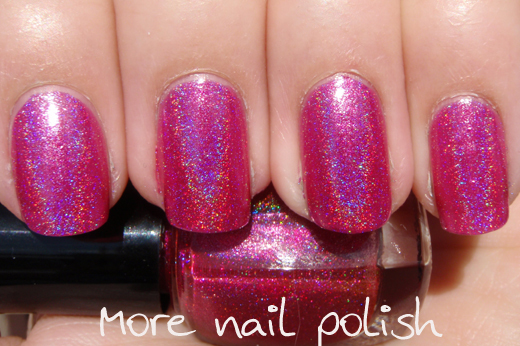 I love all the holos you've made so far. All your frankens. Your entire blog. Gaaaaah!...ok. Can you try a duochrome? I just love your post! So fun!